Welcome to the 2013-2014 school year, Panthers! 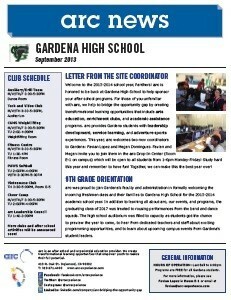 arc is honored to be back at Gardena High School to help sponsor your after school programs. For those of you unfamiliar with arc, we help to bridge the opportunity gap by creating transformational learning opportunities that include arts education, enrichment clubs, and academic assistance programs. arc provides Gardena students with leadership development, service learning, and adventure sports experiences. This year, arc welcomes two new coordinators to Gardena: Favian Lopez and Megan Dominguez. Favian and Megan invite you to join them in the arc Drop-In Center (Room E-1 on campus) which will be open to all students from 1-6pm Monday-Friday! Study hard this year and remember to have fun! Together, we can make this the best year ever!